Grab your camera! Beautiful illustrations of headwear, each just above a cut-out space the exact size of your cat's head . . .
People love cats. People love taking pictures of cats. And people particularly love taking pictures of cats behaving like humans. Cats in Hats is a book that does exactly what it says on the cover. We provide the hats, you provide the cats. 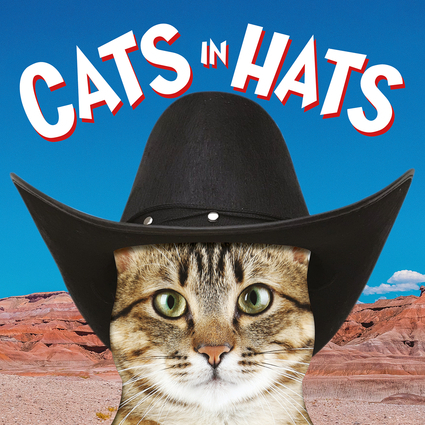 Featuring a sturdy framework of 16 board-book backgrounds, each with a delightfully illustrated item of headwear and a cut-out shape handily designed to fit a cat's head, it offers a wealth of feline photo-opportunities. The instructions are simplicity itself. Choose your frame. Position your cat. Take your photograph or video. And then, if you choose, post your images on whichever website takes your fancy: but ideally the Cats in Hats one we have set up for your convenience. Ammonite Press publishes illustrated reference, guide and gift books that bring the worlds of photography, history and pop culture into sharper focus.